Patients with chronic inflammatory demyelinating polyradiculoneuropathy (CIDP) show varying degrees of response to intravenous immunoglobulin (IVIg) therapy. 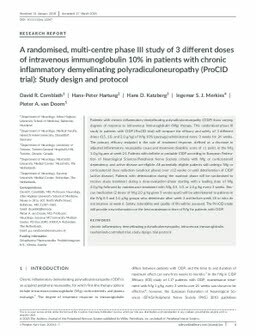 This randomised phase III study in patients with CIDP (ProCID trial) will compare the efficacy and safety of 3 different doses (0.5, 1.0, and 2.0 g/kg) of IVIg 10% (panzyga) administered every 3 weeks for 24weeks. The primary efficacy endpoint is the rate of treatment response, defined as a decrease in adjusted inflammatory neuropathy cause and treatment disability score of ≥1 point, in the IVIg 1.0 g/kg arm at week 24. Patients with definite or probable CIDP according to European Federation of Neurological Sciences/Peripheral Nerve Society criteria with IVIg or corticosteroid dependency and active disease are eligible. All potentially eligible patients will undergo IVIg or corticosteroid dose reduction (washout phase) over ≤12weeks or until deterioration of CIDP (active disease). Patients with deterioration during the washout phase will be randomised to receive study treatment during a dose-evaluation phase starting with a loading dose of IVIg 2.0 g/kg followed by maintenance treatment with IVIg 0.5, 1.0, or 2.0 g/kg every 3 weeks. Rescue medication (2 doses of IVIg 2.0 g/kg given 3 weeks apart) will be administered to patients in the IVIg 0.5 and 1.0 g/kg groups who deteriorate after week 3 and before week 18 or who do not improve at week 6. Safety, tolerability and quality of life will be assessed. The ProCID study will provide new information on the best maintenance dose of IVIg for patients with CIDP.